Background: Notch signaling is activated upon engagement of the Notch receptor with its ligands, the DSL (Delta, Serrate, Lag2) proteins of single-pass type I membrane proteins. The DSL proteins contain multiple EGF-like repeats and a DSL domain that is required for binding to Notch (1,2). 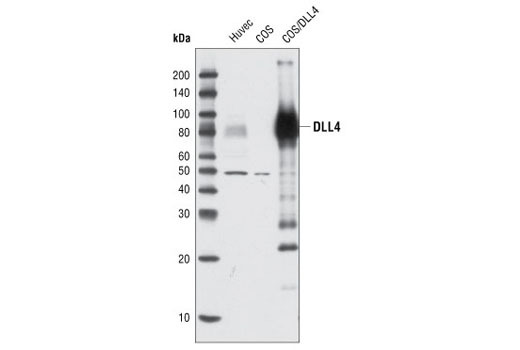 Five DSL proteins have been identified in mammals: Jagged1, Jagged2, Delta-like (DLL) 1, 3 and 4 (3). Ligand binding to the Notch receptor results in two sequential proteolytic cleavages of the receptor by the ADAM protease and the γ-secretase complex. The intracellular domain of Notch is released and then translocates to the nucleus where it activates transcription. Notch ligands may also be processed in a way similar to Notch, suggesting a bi-directional signaling through receptor-ligand interactions (4-6). Background: Dishevelled (Dsh) proteins are important intermediates of Wnt signaling pathways. 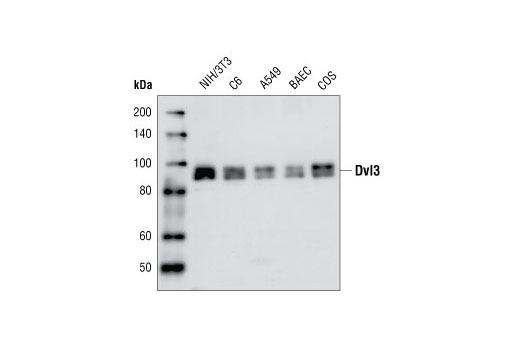 Dsh inhibits glycogen synthase kinase-3β promoting β-catenin stabilization. Dsh proteins also participate in the planar cell polarity pathway by acting through JNK (1,2). There are three Dsh homologs, Dvl1, Dvl2 and Dvl3 in mammals. 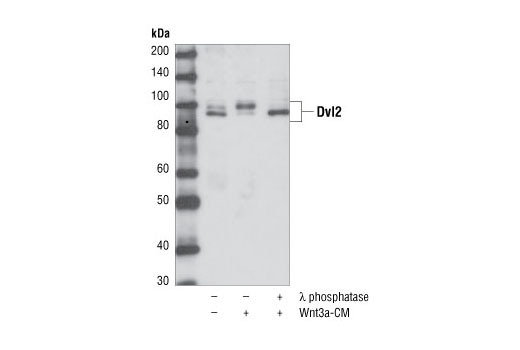 Upon treatment with Wnt proteins, Dvls become hyperphosphorylated (3) and accumulate in the nucleus (4). Dvl proteins also associate with actin fibers and cytoplasmic vesicular membranes (5) and mediate endocytosis of the Fzd receptor after Wnt protein stimulation (6). 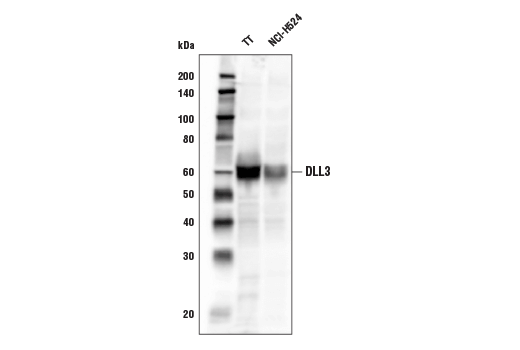 Overexpression of Dvl has been reported in certain cancers (7,8). Background: The T-box family of transcription factors is named for their shared homology with the DNA binding domain of the mouse brachyury (T) gene product. Members of this family bind DNA and are capable of transcriptional activation. They also have evolutionarily conserved expression patterns and roles in embryonic development, primarily mesoderm development (1). EOMES, or Tbr2 (T-box brain 2), is a master regulator of mesoderm formation that is also essential for trophoblast formation, gastrulation, neurogenesis and the differentiation of certain T cell subsets. Embryos from EOMES knock-out mice die soon after implantation due to their inability to develop a trophoblast (2,3). Conditional neural knock out mice show defects in development of a specific population of neural progenators known as Intermediate Progenator Cells (IPCs) that give rise only to neurons (4,5). These cells are formed from the radial glia in the ventricular and sub-ventricular zones of the cortex. Expression of EOMES increases as cells develop from radial glia to IPCs and then decreases as IPCs progress to neurons. Recent evidence suggests that EOMES and IPCs may also play a role neurogenesis in the adult hippocampal SGZ (5). 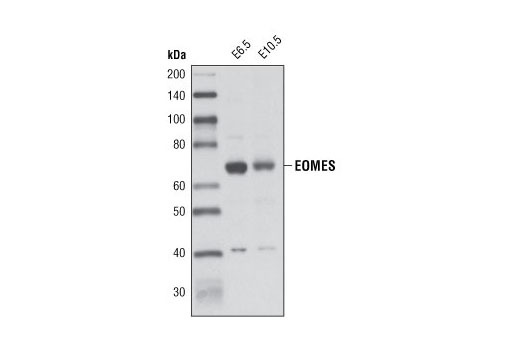 EOMES is also a key transcription factor for memory T cells and for full effector differentiation of CD8+ T cells (6). Expression of EOMES is induced in CD8+ T cells following viral infection and bacterial infection where sufficient IL-12 has been produced to elicit acute host cell response (7). Background: Forkhead box (Fox) proteins are a family of evolutionarily conserved transcription factors defined by the presence of a winged helix DNA binding domain called a Forkhead box (1). In humans, there are over 40 known Fox protein family members, divided into 19 subfamilies, which have evolved to regulate gene transcription in diverse and highly specialized biological contexts throughout development (2). Mutations that disrupt the expression of Fox gene family members have consequently been implicated in a broad array of human disorders, including immunological dysfunction, infertility, speech/language disorders, and cancer (3,4). Background: Forkhead box (Fox) proteins are a family of evolutionarily conserved transcription factors containing a sequence known as Forkhead box or winged helix DNA binding domain (1). The human genome contains 43 Fox proteins that are divided into subfamilies. 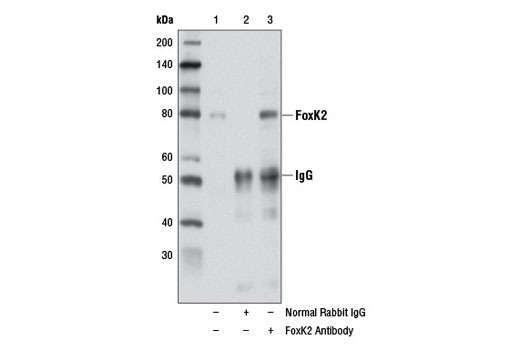 The FoxP subfamily has four members, FoxP1 - FoxP4, which are broadly expressed and play important roles in organ development, immune response and cancer pathogenesis (2-4). The FoxP subfamily has several characteristics that are atypical among Fox proteins: their Forkhead domain is located at the carboxy-terminal region and they contain motifs that promote homo- and heterodimerization. 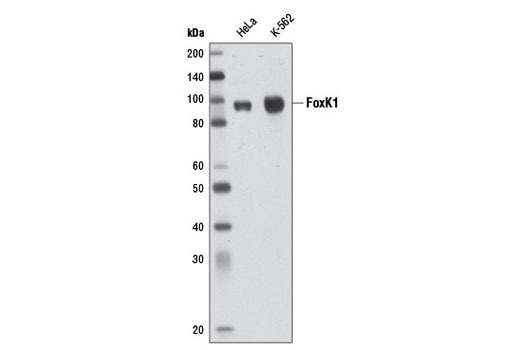 FoxP proteins usually function as transcriptional repressors (4,5). Background: Frizzled (Fzd) belongs to the seven transmembrane-spanning G-protein-coupled receptor (GPCR) superfamily (1). 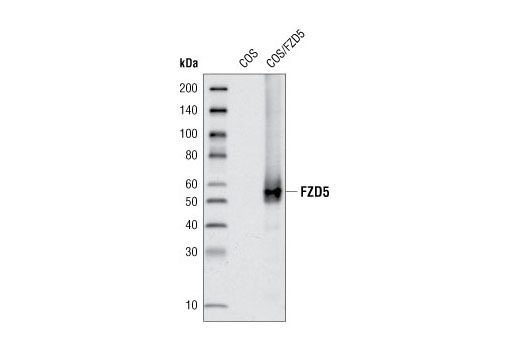 Fzds have a large extracellular N-terminal region containing a cysteine-rich domain (CRD), which is involved in binding to Wnt proteins (1,2). 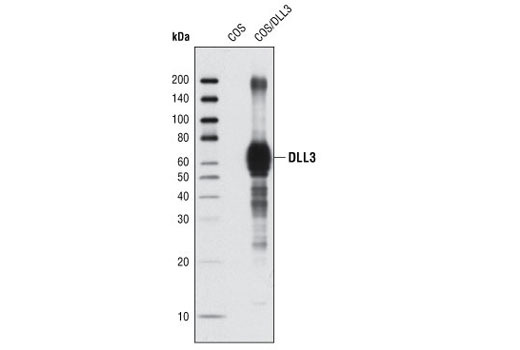 The intracellular C-terminus binds to the PDZ domain of Dvl proteins, a major signaling component downstream of Fzd (3). 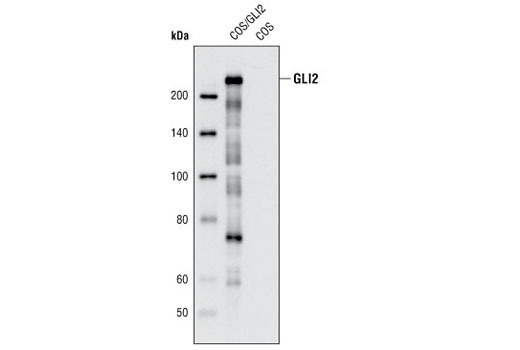 Wnt proteins bind to Fzd and the co-receptors LRP5 or LPR6, and activate Wnt/β-catenin pathway through inhibiting phosphorylation of β-catenin by GSK3-β (4,5). In addition to this canonical Wnt/β-catenin pathway, some Wnt proteins can also activate the Fzd/Ca2+ pathway and Fzd/PCP (planar cell polarity) pathway (6,7). The mammalian Fzd subfamily has 10 members (Fzd1 to Fzd10) and they may mediate signaling through different pathways (8). 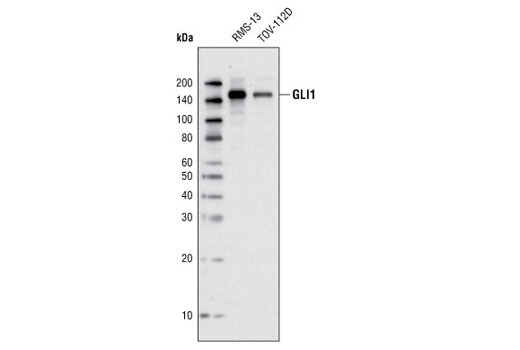 Some Fzds can also bind to other secreted proteins, like Norrin and R-Spondin (9-11). Background: GATA proteins comprise a group of transcription factors that are related by the presence of conserved zinc finger DNA binding domains, which bind directly to the nucleotide sequence core element GATA (1-3). 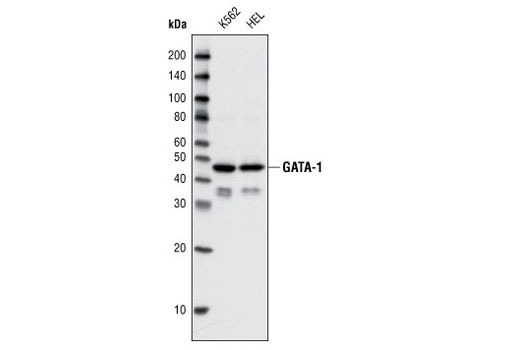 There are six vertebrate GATA proteins, designated GATA-1 to GATA-6 (3). Background: GCNF (Germ Cell Nuclear Factor), also known as NR6A1 (Nuclear Receptor Subfamily 6 Group A member), is an orphan member of the nuclear receptor gene superfamily (1). It has been shown to be expressed in the nervous system during development and during specific stages in maturing germ cells of the ovary and testis in the adult, and has probable roles in gametogenesis, neurogenesis, and normal embryonic development during gastrulation (1,2). Inactivation of GCNF in mouse results in abnormal posterior development, impaired midbrain development, insufficient closure of the neural tube, and eventual embryonic death (3). 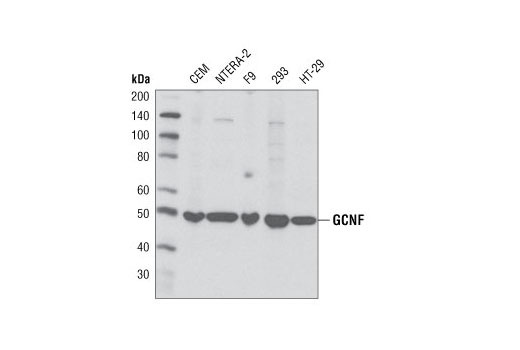 GCNF has been shown to be a repressor of OCT-4 and of the protamine genes (4,5) and plays a critical role in the control of gene expression during embryogenesis and spermatogenesis (2,6). Background: Gremlin is a secreted antagonist of bone morphogenetic proteins that play important roles during development. Gene targeting generates gremlin deficient mice that die shortly after birth due to absent kidneys and defects in lung septation (1-3). Gremlin also plays a role in cardiomyogenesis and angiogenesis (4,5). TGF-β can induce gremlin expression under pathological conditions. Gremlin colocalizes with TGF-β in tubulointerstitial fibrosis associated with chronic allograft nephropathy and is expressed in diabetic nephropathy in vivo (6-8). 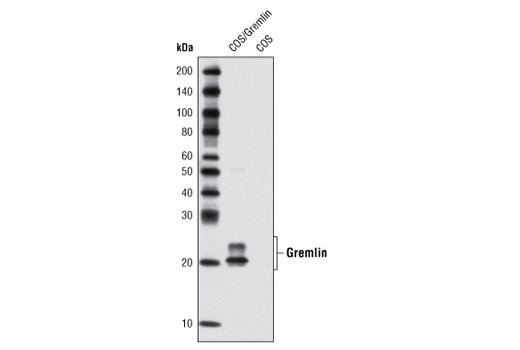 Gremlin is widely expressed in cancer associated stromal cells and can enhance cancer cell proliferation (9). Background: Heregulin (HRG), also called neuregulin (NRG1), neu differentiation factor (NDF) or glial growth factor-2 (GGF-2), is a soluble growth factor synthesized as a transmembrane precursor molecule. Metalloproteinases and other proteases catalyze the cleavage of its extracellular domain which is then released and functions as a ligand for ErbB3 and ErbB4 receptor tyrosine kinase. The signaling pathways of HRG-ErbB3/ErbB4 are involved in regulation of cell proliferation, differentiation, invasion, and survival of both normal and malignant tissues (1,2). Abnormality of HRG-ErbB signaling leads to development of a variety of human diseases.HRG family has four isoforms including HRG-1, -2, -3 and -4, which are derived from alternative exon splicing. Moreover, they showed various tissue expression and biological activities (3). 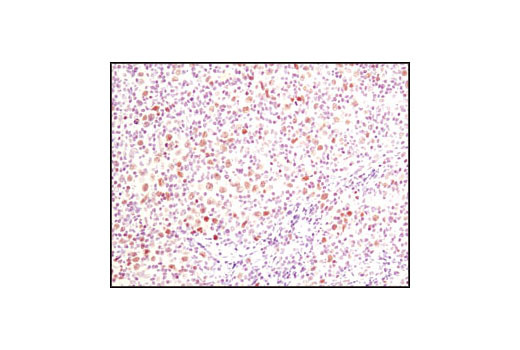 Background: The Hippo pathway is an important evolutionarily conserved signaling pathway that controls organ size and tumor suppression by inhibiting cell proliferation and promoting apoptosis (1,2). An integral function of the Hippo pathway is to repress the activity of YAP (Yes-associated protein), a proposed oncogene whose activity is regulated by phosphorylation and subcellular localization (3,4). 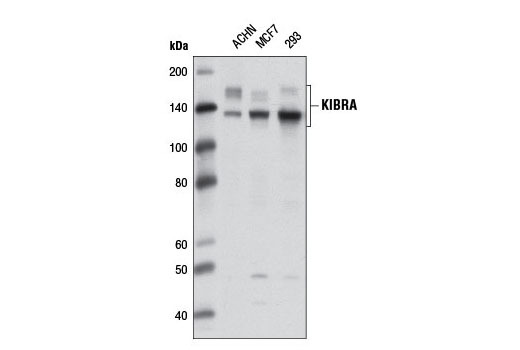 Recent studies have identified KIBRA as a novel regulator of Hippo signaling (5-7). 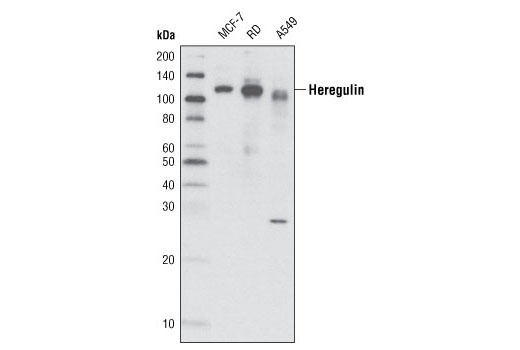 KIBRA has been shown to regulate Hippo signaling through its interaction with tumor suppressors Merlin (Mer) and Expanded (Ex) in Drosophila (7) and by associating with large tumor suppressors LATS1 and LATS2 in humans (8). In humans, KIBRA is predominantly expressed in the kidney and brain (9) and has been shown to play a role in hippocampus-related memory performance (10-12). 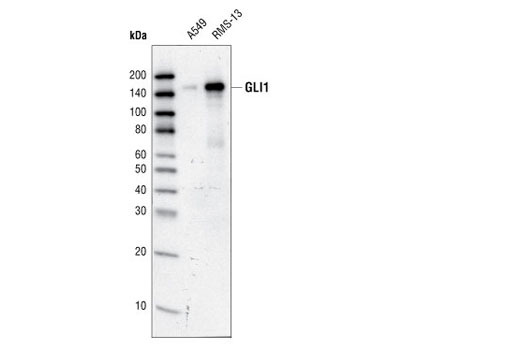 Recent studies have shown that phosphorylation of KIBRA is highest during mitosis and is controlled by aurora kinase and protein phosphatase 1 (13). Background: KLF4 is a member of the erythroid Kruppel-like factor (EKLF) multigene family that is highly expressed in the differentiating layers of the epidermis (1, 2). KLF4 plays a critical role in the differentiation of epithelial cells and is essential for normal gastric homeostasis (2,3). 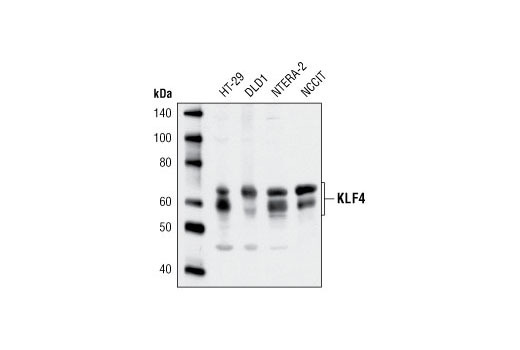 Depending on the target gene, KLF4 can function as both a repressor and activator of transcription (4). 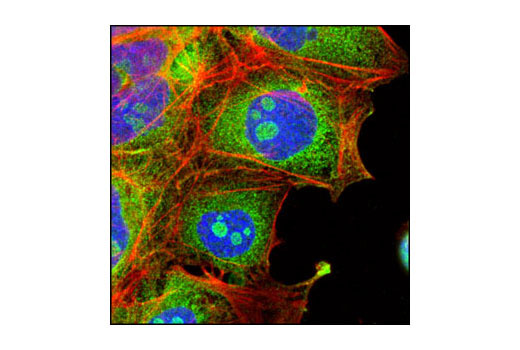 Research studies suggest this protein may function as either a tumor suppressor or an oncogene depending on tumor type, with up-regulation in human squamous cell carcinoma of the head and neck and down-regulation in colorectal carcinoma (5,6). The in vitro reprogramming of somatic cells to an embryonic-like state has been achieved by retroviral transduction of four factors: Oct-3/4, Sox2, c-Myc, and KLF4 (7). These induced pluripotent stem cells (iPS) are of great therapeutic interest as they exhibit the key characteristics and growth properties of pluripotent stem cells (8,9). Background: LIM domain-containing protein 1 (LIMD1) is a putative tumor suppressor and adapter/scaffold protein that belongs to the Ajuba family of LIM domain containing proteins. LIM domain containing proteins mediate protein-protein interactions and typically contain a pair of distinct zinc finger domains (1). 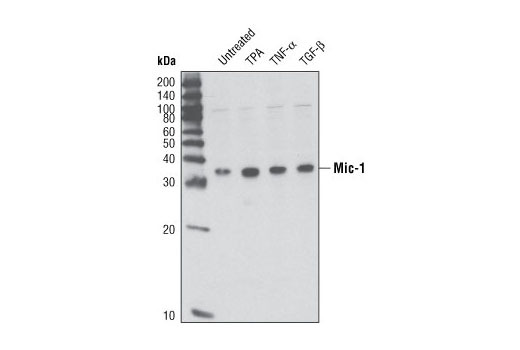 Research studies indicate that LIMD1 is involved in numerous cellular processes, including inhibition of E2F mediated transcription (2) and negative regulation of the Hippo pathway through influence on YAP phosphorylation state (3,4). 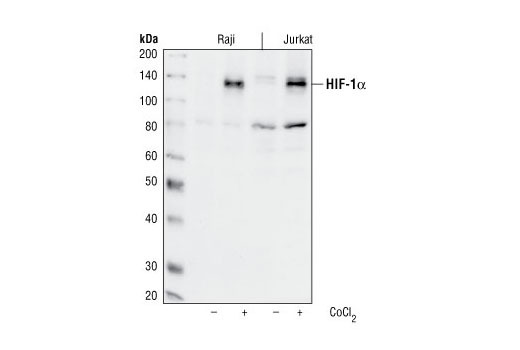 Additional studies identify LIMD1 as a hypoxia regulator as it recruits the Von Hippel-Lindau (VHL) protein and the hydroxylase PHD1 to a protein complex that promotes initiation of HIF-1α ubiquitination and degradation (5). 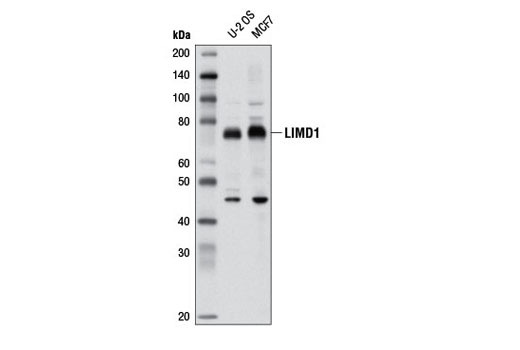 Research evidence supporting the role of LIMD1 as a tumor suppressor includes the down regulation of the protein in 80% of lung cancers (6), loss of LIMD1 expression in head and neck cancers (7), and altered subcellular localization in cases of breast cancer (8). 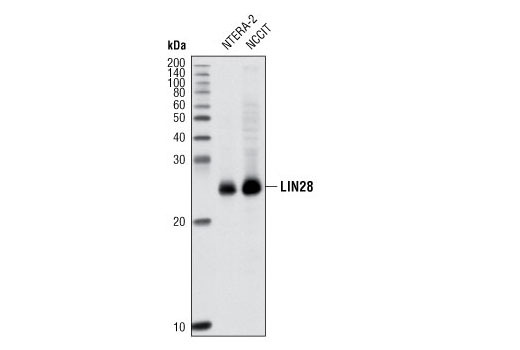 Background: LIN28A and LIN28B are conserved, developmentally regulated RNA binding proteins that inhibit the processing and maturation of the let-7 family of miRNAs (1,2). The let-7 miRNAs have been implicated in repression of oncogenes such as Ras, Myc, and HMGA2 (3). 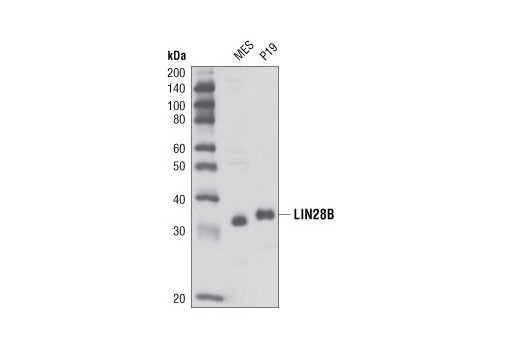 It has recently been shown that upregulation of LIN28A and LIN28B in primary human tumors and human cancer cell lines is correlated with downregulation of let-7 miRNAs (4). LIN28 genes are reported to be involved in primordial germ cell development and germ cell malignancy (5). In addition, allelic variation in LIN28B is associated with regulating the timing of puberty in humans (6). 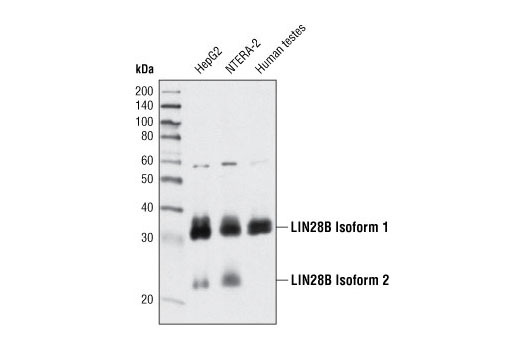 Overexpression of LIN28A, in conjunction with Oct-4, Sox2, and Nanog, can reprogram human fibroblasts to pluripotent, ES-like cells (7). Background: MAFB belongs to the musculoaponeurotic fibrosarcoma (MAF) family of basic leucine-zipper transcription factors (1). In mouse embryo, MAFB expression is first detected at E10.5 (2, 3). Early in development, MAFB drives differentiation of both glucagon-producing α-cells and insulin-producing β-cells in the pancreas, but later plays a more decisive role in the maturation and maintenance of functional α-cells (4, 5). Consistent with MAFB playing a critical role in mature α-cells, MAFB is enriched in α-cells within 2 weeks of birth in the pancreas (6). Glucagon and insulin secretion is tightly regulated, and imbalances in these hormones contribute to metabolic conditions. Therefore, understanding the role of MAFB in α-cell development, maintenance, and physiological function may contribute to developing deeper insights into how these cells contribute to metabolic diseases like diabetes. 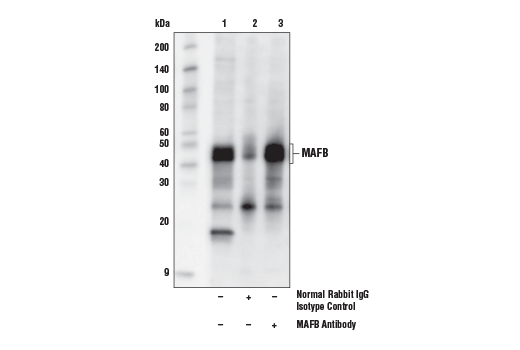 MAFB also regulates monocyte differentiation, indicating MAFB functions beyond the pancreas (7). Background: Mastermind-like (MAML) family of proteins are homologs of Drosophila Mastermind. The family is composed of three members in mammals: MAML1, MAML2, and MAML3 (1,2). 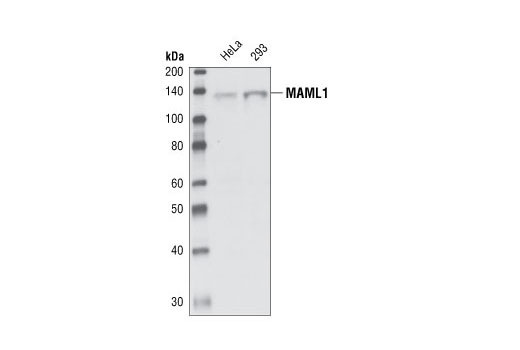 MAML proteins form complexes with the intracellular domain of Notch (ICN) and the transcription factor CSL (RBP-Jκ) to regulate Notch target gene expression (3-5). MAML1 also interacts with myocyte enhancer factor 2C (MEF2C) to regulate myogenesis (6). 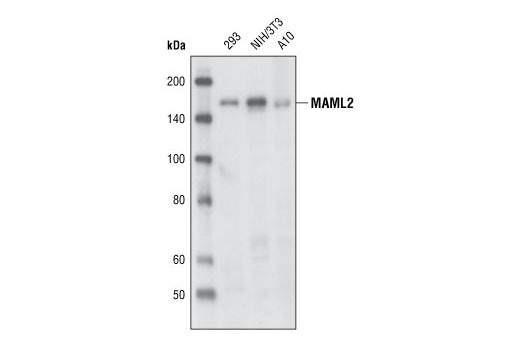 MAML2 is frequently found to be fused with Mucoepidermoid carcinoma translocated gene 1 (MECT1, also know as WAMTP1 or TORC1) in patients with mucoepidermoid carcinomas and Warthin's tumors (7). Background: Macrophage inhibitory cytokine-1 (Mic-1), also termed GDF15 (1), PTGF-β (2), PLAB (3), PDF (4), and NAG-1 (5), is a divergent member of the transforming growth factor-β (TGF-β) superfamily (6). Like other family members, Mic-1 is synthesized as an inactive precursor that undergoes proteolytic processing involving removal of an N-terminal hydrophobic signal sequence followed by cleavage at a conserved RXXR site generating an active C-terminal domain that is secreted as a dimeric protein. Mic-1 is highly expressed in the placenta and is also dramatically increased by cellular stress, acute injury, inflammation, and cancer. In the brain, Mic-1 is found in the choroid plexus and is secreted into the cerebrospinal fluid (7). It is also a transcriptional target of the p53 tumor suppressor protein and may serve as a biomarker for p53 activity (8,9). During tumor progression, Mic-1 has various effects on apoptosis, differentiation, angiogenisis, and metastasis, and may also contribute to weight loss during cancer (10,11).